Thane Heins´ "Perepiteia" generator seems to turn magnetic friction into a magnetic boost, causing the motor to accelerate in a positive feedback loop. Thane Heins knows the track record of inventors that claim to make breakthroughs in power generation methods, especially when they claim to defy the second law of thermodynamics. Every so often, a (usually untrained) scientist comes along with a machine that supposedly creates more energy than is put in. Every time, the ideas have been rebuked by real scientists. That's why 46-year-old Heins, a college drop-out from Ottawa who's been working on his project since 1985, is being very cautious. He is the first to admit that he doesn't know how his machine works from a physics standpoint. He just hopes that someone else might understand. Last week, Heins demonstrated his machine to MIT professor Markus Zahn, an expert in electromagnetic and electronic systems. It proved interesting enough to stump the professor, as well. But Zahn thinks the idea is worth investigating further. "It's an unusual phenomena I wouldn't have predicted in advance," Zahn told The Toronto Star. "But I saw it. It's real." In Heins' machine, he explains that magnetic friction somehow gets turned into a magnetic boost. Working with an electric motor, he attached the drive shaft to a steel rotor with small round magnets lining its outer edges. 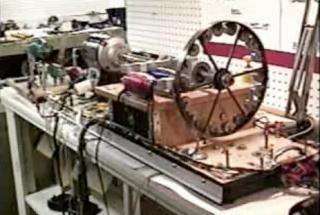 In this set-up of a simple generator, the rotor would spin so that the magnets passed by a wire coil just in front of them, generating electrical energy. Then Heins did an experiment: he overloaded the generator to get a current, which typically causes the wire coil to build up a large electromagnetic field. Usually, this kind of electromagnetic field creates an effect called "Back EMF" due to the so-called Lenz's law. The effect should repel the spinning magnets on the rotor, and slow them down until the motor stops completely, in accordance with the law of conservation. But instead of stopping, the rotor began to accelerate. Heins recounts that the first time it happened, the magnets starting flying off and hitting the walls, as he ducked for cover. The magnetic friction wasn't repelling the magnets and wire coil. Instead, as Heins explains, the steel rotor and driveshaft had conducted the magnetic resistance away from the coil and back into the electric motor. In effect, the Back EMF was boosting the magnetic fields used by the motor to generate electrical energy and cause acceleration. The faster the motor accelerated, the stronger the electromagnetic field it would create on the wire coil, which in turn would make the motor go even faster. Heins seemed to have created a positive feedback loop. To confirm the theory, Heins replaced part of the driveshaft with plastic pipe that wouldn´t conduct the magnetic field. There was no acceleration. "What I can say with full confidence is that our system violates the law of conservation of energy," he says. He calls his system "Perepiteia," which in Greek means an action that has the opposite effect of what is intended. But he will leave it to others to decide if the technique can be described as "perpetual motion." In 2005, Heins formed a company called Potential Difference Inc. to develop and market his invention. He's also been working with researchers from the University of Ottawa on its development, and has demonstrated the machine to several institutions, including the University of Virginia, Michigan State University, the University of Toronto and Queens University. Heins has also been raising money for his invention, asking individuals such as former U.S. vice-president Al Gore, Virgin Group founder Richard Branson, Tesla Motors chairman Elon Musk, and Google´s "ReCharge IT" project. Due to his obsession with his machine, he has suffered a failed marriage and lost custody of his two children, and is currently unemployed. He doesn´t believe that his idea is a scientific breakthrough of any kind - he just thinks that it deserves to be investigated. MIT´s Zahn agrees. "To my mind this is unexpected and new, and it´s worth exploring all the possible advantages once you´re convinced it´s a real effect," says Zahn. "There are an infinite number of induction machines in people´s homes and everywhere around the world. If you could make them more efficient, cumulatively, it could make a big difference." is the fly wheel with the magnets resonant at a frequency that is just over the initial RPM x 18 magnets? Would that induce it (no pun) to turn faster until resonance is achieved? Can you get more energy out of a solar panel than what was used to produce it? If so, would that be considered 'free energy'? These other free energy (or perpetual motin) devices, if they indeed work, would not necessarily create energy from 'nothing'. Much like a solar panel, they could be capturing some other form of electromagnetic radiation that scientists are unaware of. Maybe? Let's no longer say 'impossible' and 'never' when it comes to science and technology. If it were real, anyone could build one and it would do the same thing. If he was sincere, he'd let the scientists take it apart, probe the area with sensors, etc. to find the accidental feature responsible for the effect. Shorting out the coils simply grossly mismatches the impedance, and thus causes far less power to be transferred from the rotor to the coils, leaving that power to accelerate the rotor. Nothing strange is happening here. Another way to look at it: The back EMF pushes on the magnets roughly the same amount whether they are approaching the coils are receding from the coils, and thus no net power is transferred to the coils. No idea why that MIT prof didn't understand this (actually I DO have an idea why he didn't understand, but I won't go there). Here's a third way to look at it: If all you have is conductors and insulators (no resistors) then no power is used up. That's what you have when you short out the coils, so most of the power from the motor simply accelerates the rotor. This is another of the many cases of inventor's delusion. See the thread about him on overunity.com and note the comments by DMBoss. As anyone can see on our website, we do not believe magnetic energy conversion systems are impossible. To the contrary, we are busy developing our own. However, genuine breakthrough devices, which can be rotary or solid-state, reflect new science. Skepticism is justified and understandable. However, Zero Point Energy, as the late Dr. Robert Forward suggested in a paper in Physical Review B in 1984, is likely to prove a major new source of energy in the not-too-distant future. Hans Coler, a German inventor, produced two solid-state generators. A small one, shown in 1926 to university professors. And a 6 kW unit that, following a demonstration in 1937, resulted in Hitler's navy supporting the work as a potential means of recharging submarine batteries without the need to surface. His lab was bombed early in 1945, but following WWII he went to England and cooperated with British Intelligence in their positive evaluation of his work. In 1979, 34 pages of the British Intelligence Report were declassified and are easy to find on the web. He termed what we now call ZPE "space energy" and realized he had opened a disruptive door in the physics community. The words "writing letters" are missing from the above text. None of those people/institutions have written back! But this story makes it sound like they are supporting him! First of all, I seriously question whether the elite echelons of society would allow implementation of a free energy device, even if one was successfully created. The majority of those upper echelon families acheived their status via controlling resources and ENERGY. Free energy would necessitate a dramatic social restructuring of the entire world. Why would those currently on top want this? Of course, as a firm believer in science, I remain skeptical of the possibility of perpetual motion and free energy machines. Say one ACTUALLY comes along though... it's going to be another episode of "the inventors who cried wolf" and the scientific community will follow tradition and not take them seriously. As LearmSceince suggests, I seriously doubt this man receives any support. First, if he were to hook the solenoid up to a speaker and disconect the rotor-wheel from the motor shaft, so that he spun it like a free-wheel, then he would get a tone in the speaker that was 18x the angular frequency of the wheel. This tone would gradually get lower and then eventually die out though. Second, if he were to hook the motor-shaft up to the rotor and plug it in, then the energy of the bearings would just cancel out the energy output of the motor, thus reaching a terminal rotation. The tone would remain constant if the bearings were properly greased and the shaft was properly balanced, or else it would wear down the bearings. Third, if he were to hook the solenoid to the motor instead of to a speaker, then there would be a slight interference pattern on the motion, i.e. the wheel would sinousoidally accelerate/decelerate ever so slightly as the motor was plugged in but would have an average amount of angular momentum, nonetheless. Fourth, no plugged in power source, the thing dies out again, even with the solenoid attached to the motor. There would be a slight oscillatory effect in the net deceleration. funny.....you put an MIT professor name on something and it's like BAM instant credibility. this machines does not violate any laws of thermodynamics. MIT or no. Yeah, let's not start rewriting the physics textbooks just yet. New energy MUST be added to the system somewhere or it wouldn't accelerate. Not that the article isn't interesting, it is. Oh, and you should have stayed in college son, you can only pay physorg.com or MIT-professors enough to sympathise with your plea and they will because they are human .... but the laws of the universe don't really care whether you're down on your luck or not. See the video of this thing yourself! Can you get more energy out of a solar panel than what was used to produce it? If so, would that be considered 'free energy'? No it wouldn't. 'Free energy' traditionally means energy from nothing. These other free energy (or perpetual motin) devices, if they indeed work, would not necessarily create energy from 'nothing'. Then they aren't free energy nor perpetual motion machines. Much like a solar panel, they could be capturing some other form of electromagnetic radiation that scientists are unaware of. No, they couldn't. The electromagnetic spectrum and ambient sources of electromagnetic radiation very well mapped. Upon further examination, I think he may simply be improving the motor's efficiency by causing a precessional effect on the electrons in the coil of the rotor. Backward magnetic flux is traversing through the motor's shaft acting normally against the rotor's magnetic moment creating a torque which is always normal to the shaft but in the plane of the rotor coil. This torque, in turn, acts on the angular momentum of the rotor in such a way as to cause the electrons to precess around the loop in phase with the magnetic field from the stator (and thus amplifying the magnetic field-flux from the stator when he re-connects the coils at about 60 hertz frequency). Of course, the inefficiencies from the electrical precessions in the loop is why the thing sounds so vibrationally noisy, and I think he could eliminate that vibration inefficiency even further by cooling the rotor coil down with liquid nitrogen (although the nitrogen wouldn't technically improve efficiency as that needs to be cooled and compressed, but efficiency in regards to getting more power out from the amount of power put in). "....but efficiency in regards to getting more power out from the amount of power put in." Meaning getting 280 watts out instead of 235 watts out when 360 watts is being put in. I cannot believe that the USA are not able to give this extraordinary man a job. Most European politicians bombard us that the USA are the world-s best (scientific, economic ...) performers. He has incorporated a "Homopolar" motor onto the shaft of his so-called drive-motor- the voltage for it is being derived from the generator coils. yes, lets give everyone who claims to invent a perpetual motion machine (or *doesn't* claim it, but implies it pretty darn strongly nontheless) a job - at NASA, at the very least... great idea. Have you thought perhaps that he doesn't have a job because, as it says in the article, he is 'obsessed' with his machine? "What I can say with full confidence is that our system violates the law of conservation of energy,"
... he can say that with full confidence. Can you think of the main reason why those two examples, or the other common example of the proposed impossibility of flight, are quite different from claiming that something will *violate* the first and second laws of thermodynamics? He may be right at home at NASA. Just sayin'. ""Have you thought perhaps that he doesn't have a job because, as it says in the article, he is 'obsessed' with his machine? "" Having known others which had the same amount of misdirected ferver, I would have to agree! If he coupled a load to this thing, unplugged it and it ran for a week, then I'd be impressed. By the way, Perpetual Motion is not impossible and breaks no laws of physics. An object in motion tends to stay in motion until acted upon by an outside force. Did no one else here pass 6th grade science? What IS impossible is the creation of energy. On the subject of atomic energy, I can never get a straight answer on this: The amount of energy radiated away from the radioactive elements far excedes the amount of energy calculated to be "contained" in the atoms of those elements. So that means that we just don't know where the excess energy comes from, but do we know it isn't being created out of nothing. The law of conservation of energy is safe. This article is a joke. well, i laughed when a the inventor claimed - with full confidence no less - that his machine violates the law of conservation of energy... right after saying he didn't understand the physics behind it. like the law of conservation of energy was something Physics could just drop, at a moments notice, because a college drop-out said so. If you watch the video, it looks like he turns something on before he starts it up. Is it plugged in or something? Maybe I'm just missing something. What about the magnetic field of the magnets? Could that be some sort of stored energy? We we know if the magnets in this system degrade after time? That would be a possible source of additional energy. All its doing is accelerating, it's not strong enough a build to take the forces it experiences and breaks apart before the conservation of energy takes its toll and slows it down. Energy is conserved in breaking the thing to pieces! There you go, beyond the realms of deep thought in physics a simple factor denying perpetual motion is the inability to construct something tht will keep accelerating without destroying itself eventually. This seems along the same lines as the "Searl Effect"
To me it is not so astounding. I have developed a gear transmission that does not disengage to change ratios, yielding a unit with few parts, many more ratios in a smaller, lighter and less expensive package. Miracles abound. I feel sorry for this guy, this whole story is tragic. Whoever's hyping this should be ashamed of themselves. When did the internet drop to the level of reality tv shows? There's no evidence of any extra energy coming out of this guy's contraption. There's no useful data here at all, it's 100% hype. And using the poor guy's personal tragedy for media 'spin' is simply despicable. He switches the motor on before he starts the test. There's current going into his motor to drive it. When he lowers the resistance, it speeds up. There's no energy gain, except perhaps via the wall outlet which his motor is plugged into. If anything, this demonstrates how desperate we've become for a new source of energy. Probably was a bad idea to buy hummers and SUV's right after we invaded Iraq, guys. Just sayin. It's time to face the music. The Oil Wars have begun, and neither fission nor fusion nor biofuels are gonna pull our chestnuts out of the fire. We need to step up work on efficient solar energy collection systems, and wind and water-flow energy systems. For the home-owner market, preferably. And don't completely lose faith in our professional scientists. In fact we should increase their funding, especially in cutting-edge high-energy-research and astrophysical areas: theoretical advances today mean practical solutions tomorrow. There's never been a better time to invest in sheer brain power. Guys like Thane Heins have their hearts in the right places, definitely, but hardly any theoretical physics acumen. Maybe if we (as a world culture) actually *start solving* the problem of post-oil energy demands, then maybe we'll see a decline in the Oil War, and Thane can get back to his wife and kids (with a large basket of roses and a box of fine chocolates, I would suggest). And Thane, buddy, lose the baseball cap. Really. As an inventor, Heins troubles parallel Searl own struggles. Perhaps that is the price innovators have pay these days for breakthroughs inventions of this kind. Interestingly, the Searl effect also speeds up with increasing load currents and inversely the temperature drops with it. This suggests the conversion of temperature (a random state) into (less random state) electrical currents, if this is the case then all the energy we need is simply ambient and inexhaustible so long as we have the sun energy. "Last week, Heins demonstrated his machine to MIT professor Markus Zahn, an expert in electromagnetic and electronic systems. It proved interesting enough to stump the professor, as well. But Zahn thinks the idea is worth investigating further. "It's an unusual phenomena I wouldn't have predicted in advance," Zahn told The Toronto Star. "But I saw it. It's real. "": this for me is a strong cue that the invention is scientifically useful. I do not know of any definition of "what is science?". I am very interested in algorithms that can decide _a priori_ that an invention is successful or not. It seems to me that the Conservation of Energy is an ideal 'algorithm' for determining the success of a machine a priori. And some basic working familiarity with electromechanical systems is often helpful as well. Call me crazy. A couple of points: Zahn didn't say he saw extra energy come out of this thing, all he said was that it seemed to be an 'unusual phenomenon.' That isn't saying much. I don't know if you've watched Heins' videos, but I'd give twenty bucks to anyone who could walk out of that garage without being at least slightly befuddled, after hearing Heins prattle on like that about his wacky theory while pointing to apparently-irrelevant aspects of his device in operation, throwing switches back and forth right and left, and never taking more than one set of voltage and ammeter readings at the same time. Woulda been nice to see a basic schematic, or to get a simple and clear description of what exactly he had there and how it was powered (for example, many people might miss the fact that the motor is plugged into the wall, if you didn't happen to see him throw the power switch while going on and on about 'back emf' before he spins the wheel). Also, the amperage actually goes -down- when the thing speeds up (because the resistance is lower), not up. He shows that much clearly in his 3rd video (there are at least seven, as I recall). On the subject of atomic energy, I can never get a straight answer on this: The amount of energy radiated away from the radioactive elements far excedes [sic] the amount of energy calculated to be "contained" in the atoms of those elements. So that means that we just don't know where the excess energy comes from, but do we know it isn't being created out of nothing. That is not correct. The energy released was "binding energy" of the parent atom. The energy produced is =exactly= what is predicted from modern understanding of subatomic physics, and matches the difference in mass of the parent compared with the daughters. Yes, "imagine". Besides having nothing to do with reality, what is the connection of your mercury droplets to this perpetual energy motor hoax? To me it is not so astounding. "It consumes a small amount of excitation energy, which will be replaced with rare earth elements in the final SEG" and you think it's legit after reading this? I think the mockup model is simply to show some of the SEG virtues in terms of form and function for demonstrations only with external power. Those comments, I think only meant that the SEG prototype (under construction now) would rely on the Neodymium layer as a source or reservoir of electrons for the currents that are expect to drive the device thru four materials layers (a type of solid state magnetic diode). Now with regard to the Squares, well even some physicists are now theorizing that it can model quantum energy and mass distributions; it maybe that modern science is slowly catching up to John Searl's claims after all. This whole Searl deal is off-topic, but since it gets trotted out as the smokeless gun every time someone mentions 'free energy,' I'll nibble. I think the mockup model is simply to show some of the SEG virtues in terms of form and function for demonstrations only with external power. Let's make a deal then: regardless of how much power the thing uses, if Searl's latest rig defies gravity like he says it will (without wires or other conventional means), then I'll admit that you're right, and I'm a jerk (ie, that Searl isn't a con artist/fraud of absurd proportions). Deal? Those comments, I think only meant that the SEG prototype (under construction now) would rely on the Neodymium layer as a source or reservoir of electrons for the currents that are expect to drive the device thru four materials layers (a type of solid state magnetic diode). 'Magnetic diode?' ?! Snif, snif - where's the proof? Actually this is a well known Phenomena, what will happen is that the magnets will eventually disintegrate because that's where his energy is coming from. Nothing is free. who is one-step ahead is a genius; he who is two steps ahead is a crackpot subject to censure, persecution, and martyred in some cases. In the case of the SEG, well it is more like three steps ahead. So it must be tough to get the message across, but there is always hope with time and with a sliver of pioneers (free thinking, out-of-box, determined ones and not afraid of the establishment) that can determine the future for the rest of us. Keep in mind that much of the technology we now take for granted would be absurd to generations of the past; such innovations is just relative in time as to its general acceptance. Ok it%u2019s deal, but why be a jerk as you say when you can be part of the solution? There are really are no experts on the SEG except the inventor and those that have spent years thinking about the many facets of this technology. So I am now in a position to inform and not likely to be swayed or fooled by hollow opinions. I understand the SEG is generator and a prime mover, a converter of ambient energy or temperatures. A practical device capable of making Brownian motion coherent and with the formation of cooper pairs of electron condensates into electrical currents. The more current drawn out of it, the colder it gets and the faster the rollers cycloid orbits around the stator at extreme velocity. Excessively drawn power out of it makes it so cold it reaches superconductivity and demonstrates dramatic effects of Gravitomagnetic London Moment. We should refer to the good work of Martin Tajmar as an example of science starting to catch up with SEG technology finally regarding modification of gravity. The SEG is an advanced composition of innovations working seamlessly so it will require advanced analysis and thing less. Now next, the SEG is design based strictly on the values of the Searls version of the magic squares. Therefore, each component consists of four materials layers (neodymium, Teflon, permanent magnet and copper rings) specifically weight with milligrams according the square values. Without the Square values, it cannot work to convert random energy in to uniform flow of electrons. We can refer the good work of Peter Loly and associates of the University of Manitoba for investigating the physical properties of magic squares treating the numbers of each such square as physical quantities which of course is exactly what John Searl been claiming all along. After the SEG becomes self-evident (looks like it will be this year), I suspect there will be congressional hearing on the failures of the science community to recognize, investigate and implement research on such promising technologies so desperately needed; much the shuttle disaster investigations. Whew. Well, I have to give you credit for the Peter Loly find, that's good stuff Golden_Egg. But I still don't think it validates Searl's claims of power generation or antigravity. I know, I'm a rotten egg. My reasoning is simple: it takes energy to convert entropic states of energy into coherent forms of energy. This remains an undisputed fact of physics. If Searl can build a rig that does otherwise, and he allows it to be tested as all major science discoveries must be tested (and it's validated) ...then I'll start building the things for friends and family, thereby doing my part to ameliorate the energy problem. But I'm not expecting it to happen. I think there are far more practical approaches which are already within our reach, and some theoretical concepts which are far more plausible for long-term solutions. I also think it's a reach to cite Tajmar's work as evidence that Searl is onto something. Among other reasons, Tajmar's tests (seem to) indicate a force antiparallel to the rotation of his rings, not an axial force at all (which Searl claimed of his SEG's). I'd love to be proven wrong. But to date, there's zero credible evidence that 'free energy' or 'antigravity' effects have been generated by human beings. And I see no evidence to suggest that Thane C. Heins has achieved anything useful. Do I think it should be examined properly and explained completely and rationally? Definitely. Do I think the laws of thermodynamics are in any jeopardy? Absolutely not. Nevertheless, we can be certain that new methods of power generation will be discovered, and I applaud the intent of anyone who works toward that end. I just think it's absurd to expect any new solution to violate the fundamental operating principles of nature. what is the connection of your mercury droplets to this perpetual energy motor hoax? The basic idea is, the matter contains a huge amount of energy, which can be released by gravitational collapse of the matter, during which the most of matter will evaporate into radiation. Such evaporation can propel the device in proper arrangement as an analogy of "drinking bird" toy. It should be pointed out - this is not generating energy "from nothing" at all, it's just accelerating of matter evaporation into radiation, which occurs inside of our Universe spontaneously, just quite slowly. But at the case of Heins Perpetueia, I'm not very sure the experimental arrangement as such. Whether the whole device remains detached from power line at all, when accelerating? I'm not very sure about this. Note the motor cooling fan visible at the YouTube video No. 7. Its interesting, ofc it isn't a perpetual motion, but since it seems not obvious to physics professor it certainly warrants farther investigation. And why do some say its a hoax? Its an interesting experiment that should be farther investigated, thats all. And as for the perpetual motion claims they only come from press and to some less extent from that inventor guy who doesn't have a training in science, and should be discarded. What matters is what ppl trained in EMF will say if they are able to reproduce it in lab and when they have some models of what actually happens. People like Heretic and Learmscience (who apparently can't spell his own name) are complete losers. They are just iritating You to pump info. Even if You do tell them something useful, they will either do nothing or steal it.